Customised Post-It Note Pads are a fantastic promotional item that can be used anywhere and everywhere. Which means... great exposure for your Brand, Business, Company or Message. Take a look at our Top 5 picks below. 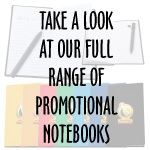 To see our full range of Post-It Note Pads & Note Cubes click HERE.